John led us to a dry, undistinguished woods on a ridgetop - the sort of place that would be easy to pass by. 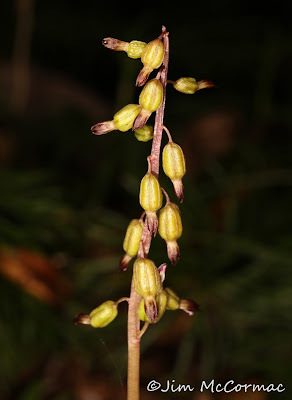 For the most part, the timber was young second-growth, and much of the forest floor was carpeted with Ground-cedar, Diphasiastrum digitatum, a colonial fern that does well in woodlands that have a history of heavy disturbance. 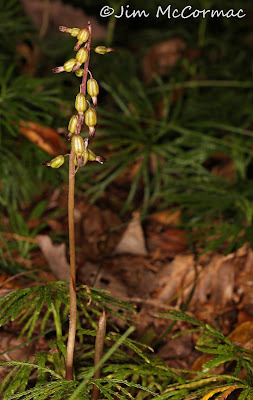 Yet it didn't take much searching to locate our target: Autumn Coralroot, Corallhoriza odontorhiza. A plant can be seen growing amongst the Ground-cedar in this shot. Even on this late date, the orchids were at or near peak bloom. Even so, it's ridiculously easy to overlook them. Coralroots are myco-heterotrophic; they derive their nutrients by intertwining rootlets with subterranean mycorrhizal fungi. The fungi are the middlemen, funneling nutrients to the orchids. 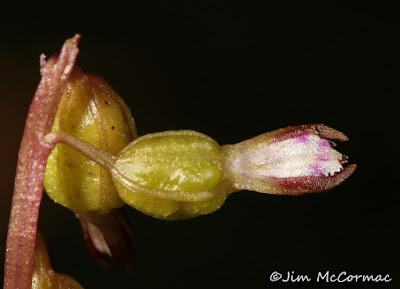 This is a common but imperfectly understood relationship in the orchid world (and many other plants). A hale and hearty Autumn Coralroot is only six inches or so in height, so I spent much time prostrate on the ground for a bird's-eye view. In many cases, prostrating one's self before the subject is necessary in plant photography. We were quite careful to note the location of all orchids around us before going to the ground, not wanting to crush any of them. Oftentimes, when framing a subject, we would look a bit beyond and there would be another orchid. And another. And more. In all, we located several dozen Autumn Coralroots and it may not even have been a great year for this population. Many orchid species have boom and bust years, and the change in above-ground numbers from year to year can be profound. 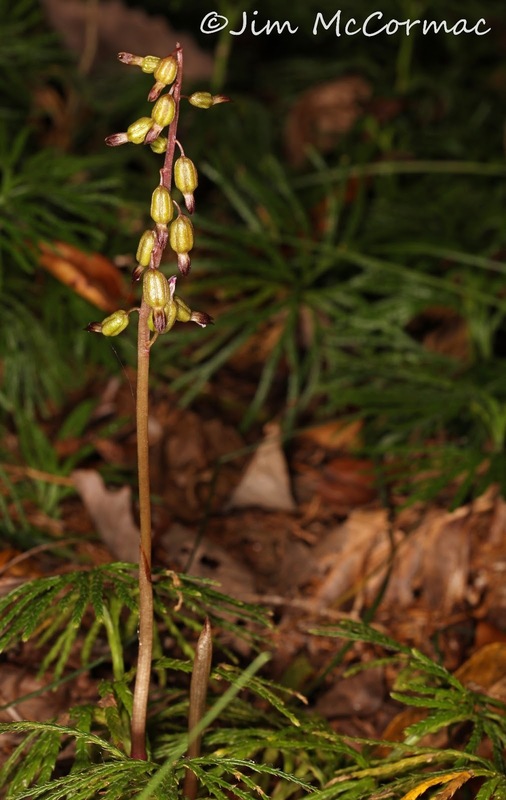 In a site where relatively few orchids surface one year, a return trip the next year might produce hundreds. In tight on a fresh flower, in its full glory. There are two varieties: Corallorhiza odontorhiza var. odontorhiza, which is these plants and the most widespread form, and variety pringlei, which apparently has a much more limited distribution. The latter has showier flowers as they actually expand fully (chasmogamous). 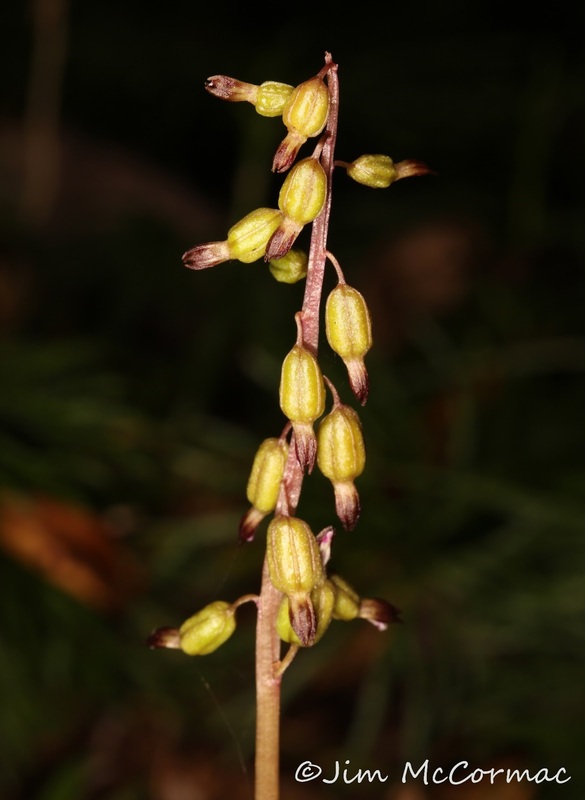 The flowers shown here are cleistogamous - they don't open fully and are probably self-pollinating. I had not seen this species for many years, well before I got heavily into photography. It was a treat to see this odd little orchids again, and have the opportunity to make images of them. I really enjoyed reading this post. I have seen this orchid all over the place this year but not in years past. I found it interesting that the species does have boom or bust years. I wonder if all rain this summer has influenced this species epic year. Your pictures and descriptions solidified my identification of this species.